One hundred days is too short a time to make an impact on an economy that has been beset by structural crises for decades. But this brief period provides hints on the general policy direction that the administration of President Benigno “Noynoy” Aquino III intends to pursue and what the people can expect from him in the next six years. Sadly, the policy signals coming from Malacañang during Aquino’s first 100 days in office are not very encouraging especially for ordinary Filipinos who have been struggling to make both ends meet. Early statements by Aquino and his economic managers indicate strong adherence to controversial free market policies embraced by past regimes which have pushed poverty and hunger to ever worsening levels. More alarmingly, it seems that Aquino plans to even outdo his predecessors in implementing these widely opposed policies. In his first State of the Nation Address (SONA) he implied willingness to implement unpopular economic reforms shelved supposedly for political reasons by former President and now Pampanga Rep. Gloria Macapagal-Arroyo. After the SONA, Aquino’s cabinet secretaries have on separate occasions announced increases in mass rail transit fares, power rate hikes to shoulder privatization debts and scrapping of the rice price subsidy. These plans form part of what may be called the grand mega-sale of the Philippines that the administration will aggressively pursue through an ambitious privatization program, which will rival the privatization frenzy of the 1990s, including via the so-called ‘public-private partnership’ (PPP) route. As Aquino proudly declared during his recent visit to the US where he enticed American and other foreign investors to participate in his PPP projects, “The Philippines is open for business”. 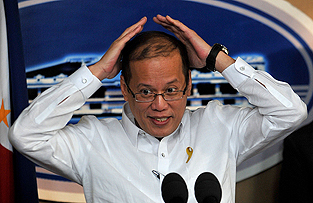 One week before he left for the US, Aquino signed Executive Order (EO) No. 8 in a renewed bid to fast track the financing, construction, and operation of vital government infrastructure through PPP. The order renamed the Build-Operate and Transfer (BOT) Center as the Public-Private Partnership Center of the Philippines (PPP Center) and earmarked P300 million of working fund for the studies and activities of selected PPP programs and projects. Aquino’s salesmanship and promises of a lucrative partnership with his administration apparently worked as he reported USD2.4 billion in committed fresh investments to the Philippines when he returned from his US trip. The said amount includes a PPP worth USD1 billion from the American Energy Solutions (AES) which plans to expand the capacity of the Masinloc power plant by up to 660 megawatts. For Aquino, privatization is the key to solving government’s most pressing problem of a huge budget deficit that has already reached P229.4 billion as of August and is expected to balloon to an all-time high of P325 billion by yearend. As he said in his SONA, “We have so many needs: from education, infrastructure, health, military, police and more. Our funds will not be enough to meet them… Our solution: public-private partnerships”. Through the BOT Law, PPP was first implemented as a policy by Aquino’s mother, the late President Corazon Aquino upon the advice of the International Monetary Fund (IMF) and World Bank. 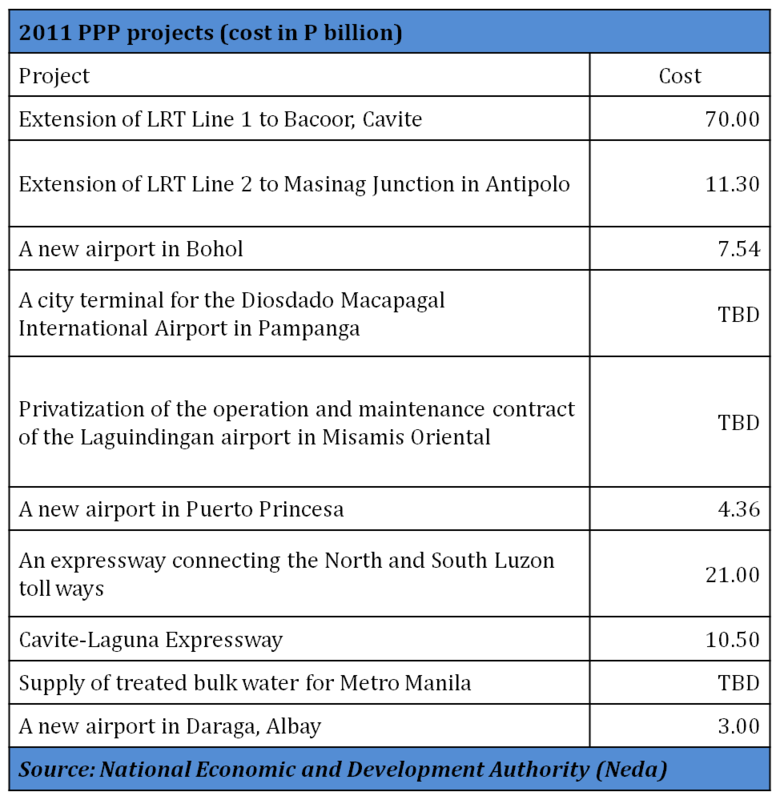 Meanwhile, of the P740 billion initial cost of all PPP projects announced by Neda, PPPs in the power sector account for P348.5 billion or 47.1 percent of the total covering 43 power projects. This despite the country’s bitter experience from previous and current PPP initiatives in the sector dating back to the BOT contracts entered into by the Cory administration that set off the financial bleeding of Napocor and jacked up power rates while failing to address the country’s energy insecurity. One week after Aquino took his oath, the Manila Electric Co. (Meralco) increased its rates by 58 centavos per kilowatt-hour (kWh). The rate hike continued the trend of rising electricity bills in the previous months which Meralco has blamed on rising generation costs. The utility giant announced a new round of rate hike in August, raising bills by 44 centavos per kWh and attributed the increase to higher prices at the Wholesale Electricity Spot Market (WESM). Then, in September, the Energy Regulatory Commission (ERC) ruled that Meralco can impose an additional charge of 3.14 centavos per kWh starting in October to recover from its customers its WESM purchases that were in excess of the mandated 10 percent during the period August 2006 to May 2007. Rising electricity rates is being felt not only by the 24.7 million people in Meralco’s franchise area but also by other households around the country. In August, the Visayan Electric Co. (Veco) also implemented a 3 percent increase in its basic charge through a performance based regulation (PBR) scheme approved by the ERC. These increases are, of course, the result of the ongoing restructuring of the power sector under the nine-year old Electric Power Industry Reform Act (Epira) of 2001 or Republic Act (RA) 9136 and could not be faulted on the Aquino administration. However, the responsibility of Aquino is to immediately address this failed policy, which was among the anti-people legacies of the previous Arroyo government. Unfortunately, instead of shifting course, the Aquino administration is steering the power sector towards more privatization and deregulation, which means more power rate hikes for hapless consumers. While Malacañang spokesman Edwin Lacierda is trying to appease the consumers by claiming that power rates may go down this month, energy officials have been conditioning the public mind of additional increases in electricity bills. Department of Energy (DOE) Secretary Jose Rene Almendras, for instance, said that consumers would have to shoulder part of the burden of paying the huge P932.21 billion in debts incurred by the National Power Corp. (Napocor), Power Sector Assets and Liabilities Management Corp. (Psalm), and the National Transmission Corp. (Transco). Bulk of the power sector’s debt, P785.09 billion, represents Psalm obligations, which it absorbed from Napocor under Epira. Specifically, these are called stranded debts and stranded contract costs. Stranded debts refer to any unpaid financial obligations of Napocor which have not been liquidated by the proceeds from the sale and privatization of its assets. Stranded contract costs, on the other hand, refer to the excess of the contracted cost of electricity under contracts entered into by Napocor with independent power producers (IPPs) as of Dec. 31, 2000 over the actual selling price of the contracted energy output of such contracts in the market. Under the Epira, these debts shall be passed on to consumers through the universal charge and could result in a rate hike of about P1.86 per kWh. As mentioned, government has already been forging various types of BOT deals with private corporations to build power plants since the time of the Cory administration. To entice investors, government forged “sweetheart deals” with them. Government agreed to shoulder all the risks associated with market demand, fuel cost and foreign exchange fluctuation. The “take or pay” clause in these onerous contracts requires Napocor to pay 70 percent to 100 percent of the capacity of an IPP (capacity fee), whether electricity is actually delivered and used or not. Meanwhile, as power rates soared and public coffers bled because of these guarantees, energy insecurity has never been truly addressed. While these onerous contracts continue to burden consumers such as the pending hike in the universal charge, the country’s serious energy woes have remained unaddressed. Until today, Mindanao, for instance, continues to experience rotating brownouts as power supply in the island remains critical. Yet this is the exactly the same flawed path that the current Aquino administration wants to track. Power officials have vowed that the sale of the remaining assets of the power sector under the Epira will push through including the remaining assets of Transco valued at P4.19 billion as well as the still unsold power plants of Napocor – on top of the fresh 43 PPP projects in the power sector that the Neda announced.